Madison Comic-Con, while relatively small compared to shows like C2E2, New York Comic-Con, and Celebration, really had an intimate feel to it. Many of the booths had a Star Wars presence, and the number of fans wearing Star Wars apparel at this show was astounding. Whether you're into shopping, getting autographs, or taking pictures with costumed characters, this Con had it all. 1). Guests. If you've seen The Clone Wars Season 6: The Lost Missions, you may remember a pair of episodes titled The Disappeared (Parts 1 & 2). The episodes feature Mace Windu and Jar Jar Binks on a mission to rescue Queen Julia from the Degoyan Cult Leaders. Cas Anvar, a voice actor who portrays the Frangawl Cult Leader, Peteen made an appearance to sign autographs for fans. Mr. Anvar had two different Star Wars 8x10s that fans were given if an autograph ticket was purchased. 2). Shopping. Many comic conventions around the country have great vendors and exhibitors. Madison Comic-Con had one of the best show floors that can be found on the convention circuit. Hasbro's six-inch Black Series line has risen to be one of the most popular line of figures available. After walking around the Madison show floor, it was easy to conclude that Black Series figures were the "hot item" for kids and collectors alike. Some of the booths even included some of the newest figures from this line, like Ahsoka Tano and Luke Skywalker in his Tatooine outfit. In addition to action figures, custom items made by talented artists filled the convention center. Leather crafts, custom pins, handmade dolls, and one-of-a-kind artwork were in abundance. As always, Funko POPS were everywhere, with a wide variety to choose from. For those into gaming, Fantasy Flight X-Wing pieces and other gaming items where available at multiple booths. 3). Costumes and Fan Tables. As expected, Rey and Kylo Ren were the most popular Star Wars costumes wandering around the show floor. 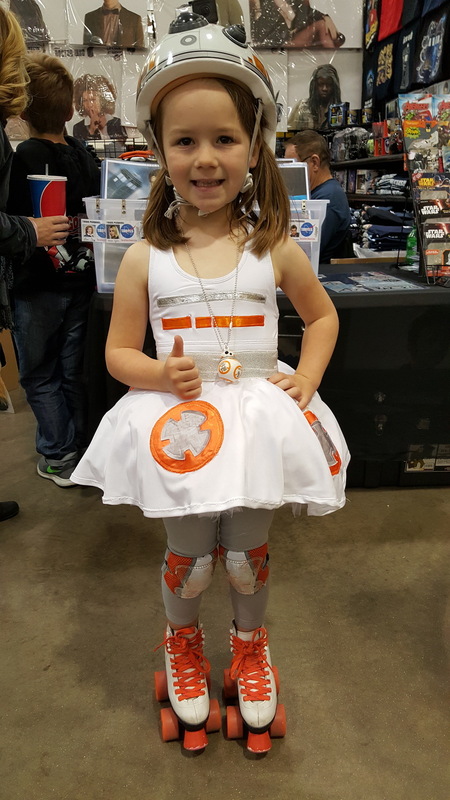 Women dressed as Kylo Ren, young girls dressed as BB-8 on roller skates, and entire families dressed as their favorite character from the franchise spent a lot of time posing for pictures with fans. One of the most popular booths was a booth where people could sign up to win a trip to Disney's Star Wars Awakening in which you can enjoy many of the new Star Wars attractions at the Disney Parks. The life-size cardboard standees made this booth nearly impossible to miss. Make sure to check back with Twin Suns Outpost for more updates and reviews of Star Wars related events!